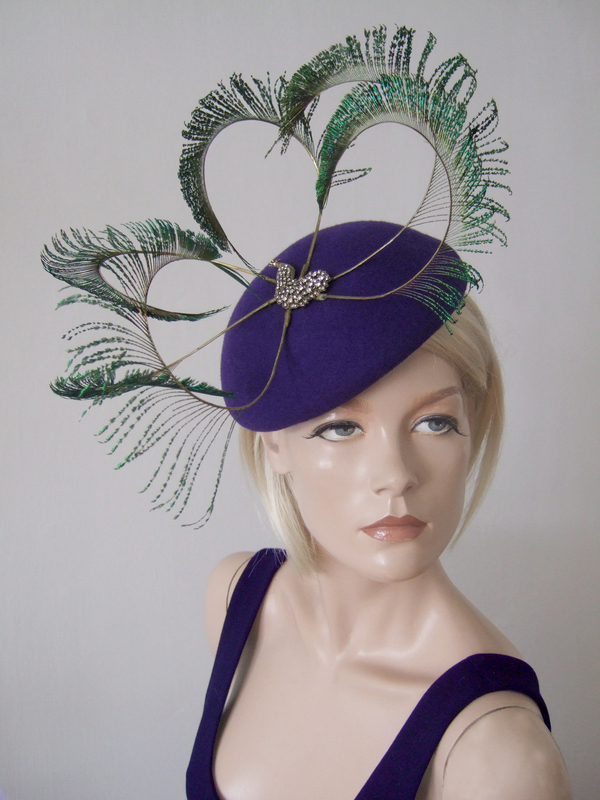 Liberty Purple Felt Beret from Contemporay London Milliner Bundle MacLaren. The Beret is called 'Kitty' and features 6 curled peacock swords with gold painted spines, fanning from a gold peacock brooch centre. Bundle is one of Londons hottest young milliners, having dressed the heads of many celebrities including Katherine Jenkins, Millie Mackintosh, and Pippa Middleton. Established in 2009, her work has regularly featured in Vogue, Tatler, Grazia, The Times, The Daily Telegraph and many more..
Beret measures 7.5" x 7.5"
Peacock Feathers giving hat an overall height of approx 7.5".